This badge was issued to MUBARAK HARUNA on 30 Aug 2014. 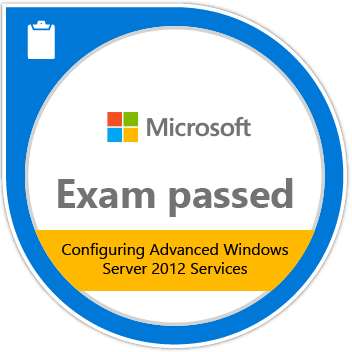 Passing Exam 412: Configuring Advanced Windows Server 2012 Services validates the skills and knowledge necessary to administer a Windows Server 2012 infrastructure in an enterprise environment. Candidates demonstrate the ability to perform the advanced configuring tasks required to deploy, manage, and maintain a Windows Server 2012 infrastructure.